Here is my contribution to the "Another Doll Quilt Swap." I am please as punch (mostly) with how this turned out. I made the HST's & pinwheels were my first thought, but I was afraid of those 8 points coming together... The worked out great! I love my quilting idea - it is like a second pinwheel, only mu 1/4 inch from the seams idea did not work out so well - I guess i should be happy that they are not "in the ditch." I've got my partner for the Summer Doll Quilt Swap - I trolled her blog yesterday & I have no idea her "style." But I have a "great" plan! As you know, I have been culling fabric to make room for the Calico Kitten. Several months later, the "last" Laurel Burch cat fabric line was released. (L.B. passed away, but I kind of think tkat her estate will rerun some of her ideas...) I had to have some to finish Holly's lovely quilt! I bought 2 panels & some yardage for the back & a nice piece for the binding. The back (I tried to be artsy with the yellow & stingy with the cats...) At least when I lable it by writing directly on it with a pigma pen, it will show up on the yellow! Yes, I do lable like that - often! Thanks again Holly! I still love it, especially the part about how I don't have to make it! I pulled names for the give aways - you should have received an e-mail from me requesting your snail mail address. They will be mailed over a short period of time. The first bag to be mailed is one of two to go to Oklahoma. I also already mentioned that we got furniture for the Calico Kitten. I culled/cleaned more in the stewdio to make room. I now have the bookcase in my alcove. (I need to do a lot of work in the alcove. I also need to get rid of the dinette table.) I am 99.9% sure that the space allocated for the baby furniture is adequate. Picked-up our veggies from the CSA, the mystery veggies were overgrown scallions. We ate the spinach in a salad, we grilled the asparagus & scallions. We ate the strawberries & we will be blanching the peas for dinner tonight - that leaves the radishes yet to be consumed. We also grilled hamburgers & corn. My GF came over & shared our bounty. 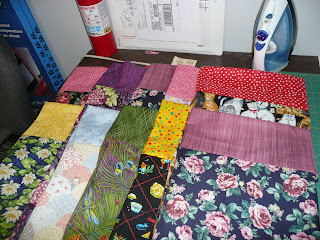 She also shared some quilty things that she is working on & I shared mine. She agreed to serge the flannel pieces into receiving blankets (How did that bag end up on the bottom of the pile?) too bad I did not hear about making them 45 inches square earlier... Oh well, the day care wants receiving blankets to use, so there will be plenty of uses for them, I am sure. She also took my ba-ba black sheep 3 bags full to take & to disburse. If I haven't mentioned it enough already - I need to get into the stewdio & straighten yet some more... (Maybe even cull some more...) Just organize at the very least! My husband & I went to Australia for our honeymoon a few years ago. We knew that we would not be eating Skippy (The Bush Kangaroo - an Aussie TV show from the 60's - it showed in the US in the late 60's early 70's.) or crocodile. What we did eat was Barramundi - a fish that is indigenous to Australia. So after shopping for baby furniture, we decided to check out Whole Foods - they had nice corn outside... The had farm raised Barramundi! We got a couple filets & a couple pieces of Icelandic Char. When we got home, my husband carried in the groceries & put the perishables away (Including the beef that we had set out to thaw earlier). We ended up eating out instead of making one of the fish dishes last night. Oh & we went to Frederick, Maryland today to see the National Museum of Civil War Medicine & a store that sells the cloth diapers that we are thinking about using - we wanted to "see" them instead of just reading about them. So I now have flannel scraps to give to a good home & hand dyed fabrics. If you want either, holler! I got 2 quilts back from the long armer this morning & dropped off another. No photos yet. Any plans for the long weekend out there? But that reminds me of another funny MIL story. My MIL for all our differences, has stated that she would buy the crib, car seat, stroller, changing table... WHEW! But she told her friends daughter that she would buy her crib & was shocked at the $___ price tag (Not her grandchild...) So my husband & I while we were not looking for the cheapest thing in the store, we were price comparing. So we called her with our preliminary total (to judge the reaction) & she said "Don't buy cr@p."
Oh I got sick in the bathroom at the baby furniture store - they have a nice ladies room complete with a "mothers room." I think that my husband may have a new appreciation for my craft... (They were pricey & not much more that a bunch of squares sewn together - some of the squares are minky.) & He admitted that the stuff that I got at the LQS to back my babies quilt feels the same. SCORE! After the sickies & the baby store - we went out for pizza. (Am I the only one who feels better after being sick?) Not the best idea - it sat hard on me & All I was able to do was to crawl into bed for the rest of the evening. Hence, so more quilting on that doll quilt. I quilted 1/4 of one of the 2 doll quilts that I have in progress. I actually basted my two doll quilts last night! YES, I am a quilter! So I did not get around to quilting. But that is my plan today! Wish me luck. Who shared quilt show photos on their blog? You have had hints throughout the weekend & some of you know or figured out the impetus. What's going on officially? The stewdio will also be the infants room. So I am rearranging furniture & culling stuff. In my mind, my stewdio will be in a "alcove" of my making. Therefore, I pulled off every piece of fabric from my Container Store shelving unit & turned it to be parallel to the closet instead of perpendicular to it along the wall. (I now hope that a piece of baby furniture will abut that unit on the back side.) Since there is space between the closet & the shelves, I plan to put my tall book case along the wall - completing my alcove & I sincerely hope that all of my stash/quilting stuff fits in that space. (I need to trash the circa 1970 dinette table that I used for cutting & sewing - on occasion). That will leave 2 low book cases for baby stuff & room for baby furniture. 30's - I was never "into" them. As a matter of fact, I only reluctantly purchased the kitty themed ones for my cat charm quilt... I then got some others from a friend & in a "grab bag" in a shop for my "I'm going to sell baby quilts business." (You can stop laughing now!) I did get some other Novelty 30's, because their scale is a nice contrast & Those Beer Steins were to fun! Cats - While I pulled each & every one off of the shelves, I did not sort them very well when putting them back, but I did cull some for the pillow cases & some are in my "3 bags full." (My general novelties & cats are sharing a space that once was only cats! Also on that shelving system are a good amount of Taupes, neutrals (creams, grays B&W's) Jan Mullen prints & my Judaica collection. CW repro - I so got caught up in the thought process of "I live in the CW region, I should make a CW quilt - or 2, 3..." I have 2 UFO's & some fabric... (I may be culling that next.) I'll keep the shirtings - I like lights & I like to be scrappy when using lights. I have more decisions to make - based upon the pile-o-bags in front of the bookcase that needs to be in the alcove - millenium charms, pieced cats (x 4 or 5), etc. & the stuff under & behind the table AKA corner that I did not get to! If you read this far - thanks! I you have any words of encouragement THANK YOU VERY MUCH! More lazy stash busting from me. I feel a bit like "Ba Ba Black Sheep" - I culled 3 bags full of fabric. Did you know that the Whole Foods Bags have grown? They are 2 or 3 inches taller that they were. You see while I am not organized enough to bring a cloth bag to the grocery store, I do get and reuse the paper bags. That doesn't count my give away baggies, books, or UFO's! Also on the chopping block - a box of quilt books. And because I was at it, I have a couple genuine UFO's - FALL, Heather Bailey, & Joel Dewberry. If you live in the USA and are interested in any of the above items, let me know. Sorry to have to limit these to the USA, but I have spent quite a bit on international postage fairly recently & I will be doing some more international shipping soon enough with a couple of my doll quilt swaps. I haven't quite figured out how to divvy them up, but I will make that decision once I get all of the requests by Friday. I have pulled the blues for mailing! I found the 3.5 inch I Spy bag & added my newbies to it. I culled some more fabrics. I pulled fabrics for a paper pieced project. My round robin is ready to mail. I found 3 tops that are ready for quilting (except for the fact that I need to find backs for them). I need to find a better way of storing them. Plumbing problems... Our shower got itself clogged beyond plunging - it did not even drain over an 8 hour period. Luckily the plumber had some advice about how to keep it from happening again. "Hail Gel" once a month, it is available at Home Depot. TGIF - I seem (oh heck lets be honest) I get more stuff done on the weekend! 5. Package fabric to be sent off to become pillow cases, package RR top to send it off for the next part to be added, package medium & dark blue scraps. 6. Photograph (etc.) Pile-o-books so that I can eventually package them off as well. That should be enough - especially considering that I have a luncheon to attend on Sunday as well. C. I signed up to be on the list for the work site child care centers - the odds are against us on getting into those centers. Husbands work option does not do infants. D. I went to the non-work sponsored child care site that is within walking distance of my office - 12 infants waiting for 1 spot that will be opening in September - the odds are once again stacked against us. H. Did not look further although there are other options out there. So hubby should be dropping off a deposit check to option F today. Maternity t-shirt in Lime Green. I need to check out her etsy shop to be tempted even more. You see 99% of me wants to load up on Snarky preggie t's 1% of realizes that I could not wear them to work, but something like this - YOU BETCHA! So far, I have tame solid t's :o). Thanks for all of the lovely words yesterday. You gals will never know how much they hepled. Now for soome real help! I am 99.9% sure that I purchased the Bento Box pattern. But I can't find it. I am almost willing to pay someone to comeover & find it for me. Can I blame the baby? But I have recently started crying without those visual cues. I cry when I come to the realization that I have not even come close to working on ANYTHING. I cry when the actual thought crosses my mind that I am really pregnant. I cry when I think about all of the things that I need to do between now & then - not just "the baby quilt" & 100+ hand made receiving blankets, but day care, etc. I cry when I am alone & wonder if this is the right thing to be doing. I am tired of all of the "new stuff" going on in my body - when will the aching stop? (If anyone out there says December 4th - aka Due date - you better start running & ducking now.) Oh & I cry when I am made to think that I am the only on who is acting like a big baby over that stuff. Oh and I am tired PERIOD. The only time that i get anything done is over the weekend - after a nap (after I slept in of course). I seriously doubt that if I changed my work scedule that any of that would change, so I will continue to arrive at 6:30 & leave at 3 - because I can still do more things after work than I could while sleeping the morning away (like visiting child care centers). Besides, the commute would add road rage to my already impressive list of things to cry about! Maybe one day this baby will allow me to make a decision! I have decided what pattern to use for the quilt for my baby! I like it because it is graphic (looks like a quilt) but the pieces are not small - minky-ish backing so this will be "big stitched." So happy to have that decision made! I have yet to get my own in return as of yet. Miniature pirate booty swap - I've got a top done. Another Doll Quilt Swap - I've got the HST's done. I have been to a few blogs where the authors mentioned "ratings." I have not seen them - on the blogs in question or on my own blog... What am I missing - has "blogger" fixed an error before I was aware of it? I had my last class last night & not a minute too soon - I am still so tired ALL THE TIME. I also found my gift certificate to the LQS - so I will not have to pay full price for the service. :o) I swear, cleaning does nothing but hide things that you will want later. As many of you know, my husband & I purchased a condo. It stared out life as a Garden Apartment. So it & all of the others are hooked up to a boiler - good thing, because that means that we do not have a water or electric bill & bad thing - we lost electricity last night - so the boiler went out. My husband had to have a cold shower - I hung out feeling very dirty waiting for the "fix." You see at 5:30 a.m. when we called the maintenance number they made it sound like they only had to flip a switch (so I called my office saying that I would be in late)... At 8-ish they had a maintenance man working on the problem & it would be fixed in about 2 hours (I called back & said that I would be in at noon) all the time, I kept checking the water... At 3:30 the maintenance man finally came over (after calling me saying that the boiler was on) after the water had been running for 30 minutes continuously he checked & guess what - IT WAS COLD! (Our building is at the end of the line - so he went to flush the line.) I finally took a luke warm shower at 5 p.m. (I HAVE to shower daily.) I did not make it into work. On Sunday, I went grocery shopping. On my list were low carb tortillas, salsa, & cheddar cheese. With those three items, I had quesadillas for dinner. :o) (I missed the sour cream & guacamole - but not enough to have purchased them for one meal.) My husband does not like Mexican food. - I got him into a Mexican restaurant once when I explained to him that a quesadilla is a Mexican grilled cheese sandwich - He likes those. & That reminds me - I may survive this pregnancy on grilled cheese sandwiches. I did not sewing today - I was grungy & only in the mood to hang out in my robe. I was so yucky that my cats did not even want to hang out with me. BUT I am doing some lazy stash busting - I am mailing some fabric to a gal who will turn them into pillow cases for cancer patients & some other fabric will be headed out in an I Spy swap. I am so much more the "just do it" kind of quilter. Neither good nor bad - just an observation. After finishing that I wrapped up my sewing machine to take her in for her annual... I got to the shop an hour & 15 minutes too late. (If they have a class they stay open - apparently the scheduled class did not go.) So I will stop by this afternoon. At that time, I will get a spool of blue hand quilting thread for my current doll quilts. This weekend, I need to get into the stewdio - I am going to measure fabrics & donate some 3/4 yard pieces to a gal who makes pillow cases for charity. I will also be cutting I SPY charms. 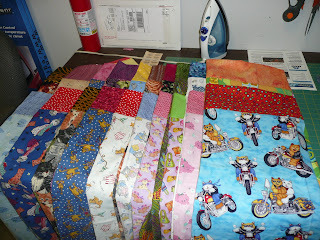 I also need to find a couple bits for the round robin quilt top that I am working on. I'll know better after a troll through the stewdio, but I may do a bright novelty stars quilt for one of the two planned baby quilts. Once upon a time ago, I started a hand appliqued project for my baby (I knew I was going to have one, I just did not know how long it would take to get there!) - that ufo has been stewing for a very long time in my "stewdio" (& my apartment before that). Lets classify that one as unrealistic. I have another fused applique with hand button holeing project, but this one has always been a "good" quilt. (Kind of like the good china that you only use every so often.) I know that that makes no sense, but there you have it. Besides, it is only a bit farther along that the other one. Lets classify that one as not the kind of baby quilt that I am talking about. You may or may not know, that I am a flickr fanatic. So I get to see a lot of inspiration - not much of is makes me say, I want to make something like that for my baby, which is good, because I have at least 3 flickr projects for big quilts. As the end of this post I am back to thinking, I want something green/yellow or a rainbow. & I've got not much beyond that figured out - except that they will both be about 60 inches square. BTW If you were having a baby, I would have NO problem figuring out what to do. So I went to my first OB appointment after being discharged from the Infertility Specialist. This was not supposed to be a big deal, but I have been looking at pregnancy websites. I have been looking at the "So what does my 8.5 week old fetuls look like?" "What is going on in there?" "When will I stop feeling so awful?" "Is this normal?" kind of stuff. After the doctor chatted with me about my life time of maladies - we got to talking about those tests (& others) and they are scarier in person than on the web. Bottom line, once you get the results, what are you going to do? If you are going to take what ever you are given (Because you have been trying longer than all of the fabric you own placed end to end) - then why bother with the tests? & to think , I though you had the tests because the doctor said so. I got another untrasound - I am no longer carrying a sea creature. The yolk sack is almost gone & we saw the umbilical cord & a hand. Boy was that baby wiggly - now wonder why I am sick!